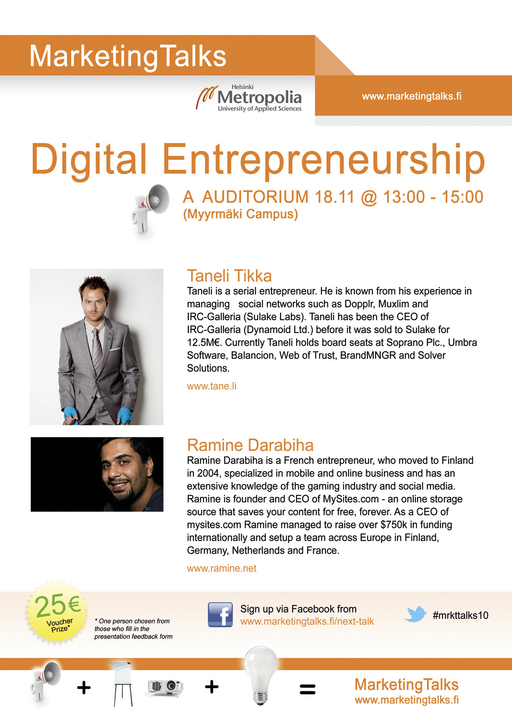 On Thursday 18th of November, a seminar covering entrepreneurship and in particular digital entrepreneurship will take place in Myyrmäki A Auditoium. Guest speakers are Taneli Tikka (specialized in managing social networks), and Ramine Darabiha (founder and CEO of MySites.com). You can sign up via Facebook (from www.marketingtalks.fi/next-talk). The twitter tag is #mrkttalks10. There is also a prize of 25 Euro voucher for one luck person of those who fills in the feedback form at the end of the event.